This beautiful quilt was given to a Northumberland couple as a wedding present in 1902. 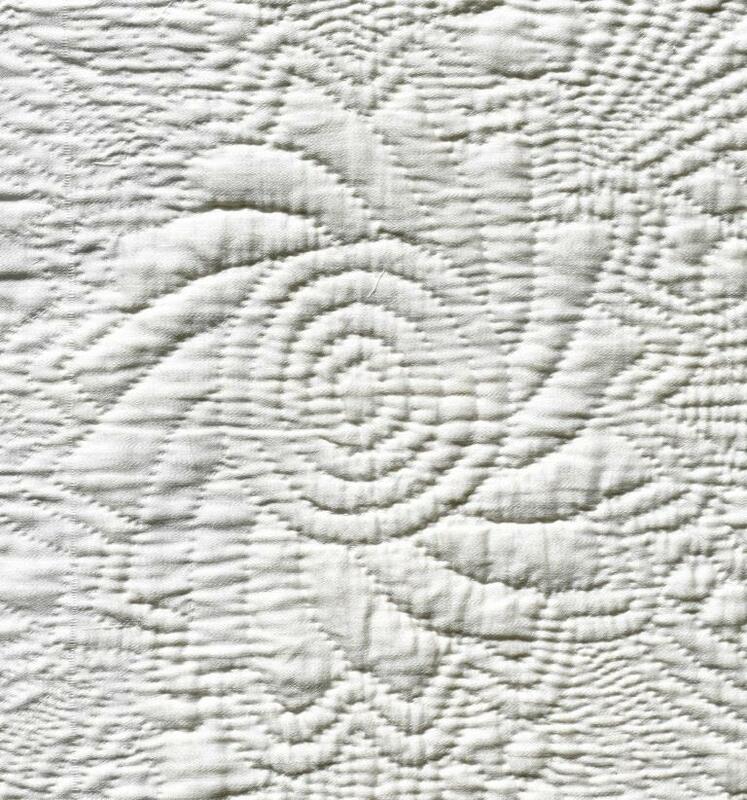 Made of white cotton sateen, this quilt has a large central motif surrounded by wide borders delineated with a narrow chain within double lines. Although retained in some areas of the UK (particularly Wales), the dividing lines had begun to disappear in the Pennine Dales of the North East of England in the last quarter of the nineteenth century, under the influence of George Gardiner of Allendale and his most well-known apprentice, Elizabeth Sanderson, who developed more free-flowing designs. 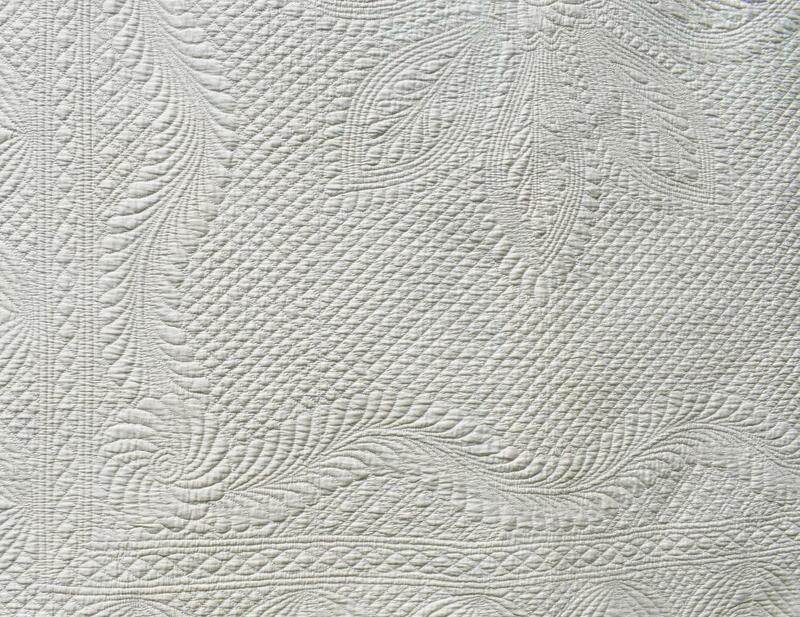 Although there are no dividing lines between the centre and the inner border, this quilt does not fully adopt their florid, elaborate style, showing only a partial transition in style away from the older style of wholecloth design. 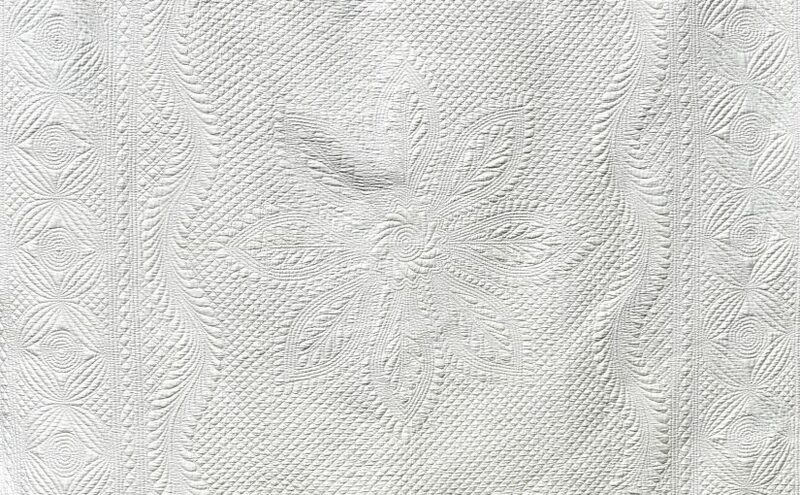 The large main motif is made from eight feather-edged “flat-iron” motifs arranged to radiate from a small flower at the centre. Each flat iron is outlined four times, and filled with a leaf spray. A fine grid of square diamonds fills the space to the first border – a running feather . 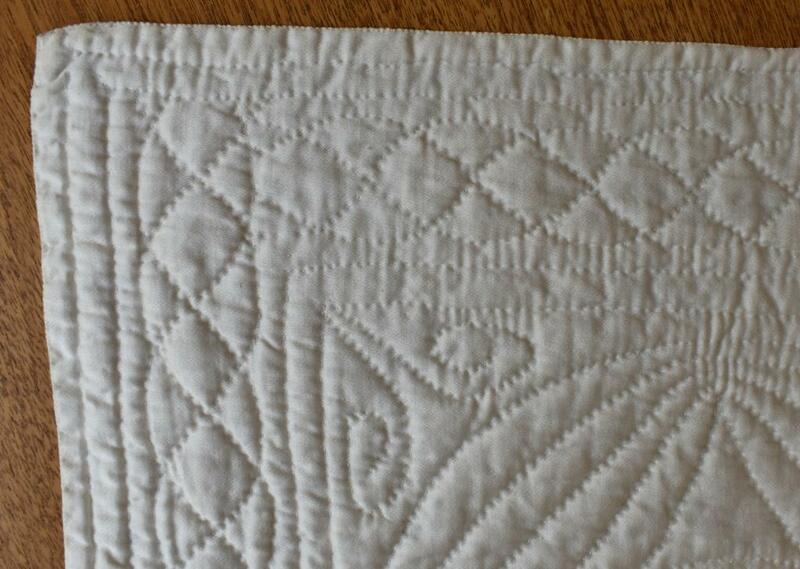 This design is a very common feature on North Country quilts. Here, it flows elegantly along the sides, but (as is usual) does not attempt to turn the corners, which are occupied with swirling roses. Did you spot that the filling pattern outside the running feather is not the same as the square diamonds inside? The quilter has chosen a double-lined grid here. After a narrow chain, the outer border is made of lined ‘wine-glass’ filled with concentric circles. A final narrow chain frames the outer edge. Again, no attempt is made to turn the corner; it just runs to the edge, and the chain on the next side simply butts against it. 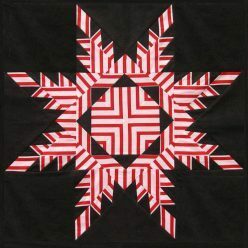 The design on this quilt is beautifully executed; the motifs are evenly spaced and well-balanced. 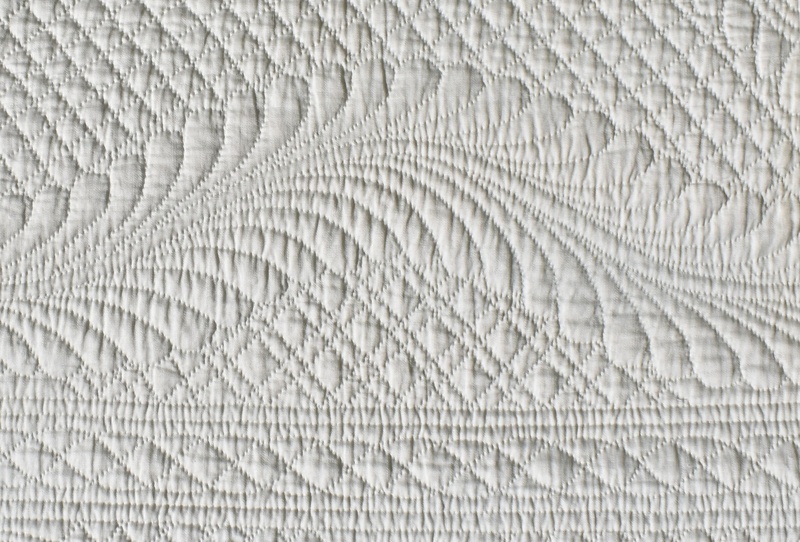 The quilting stitch is small and even, aided by the thin cotton wadding. 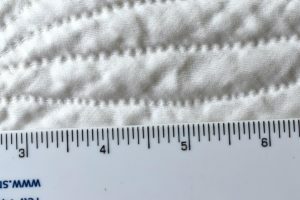 Look at the minute oversewing which finishes the butted edge – an unusual treatment. This exquisite quilt is one of the few I own with documented provenance, provided by the vendor, the granddaughter of the original owners. 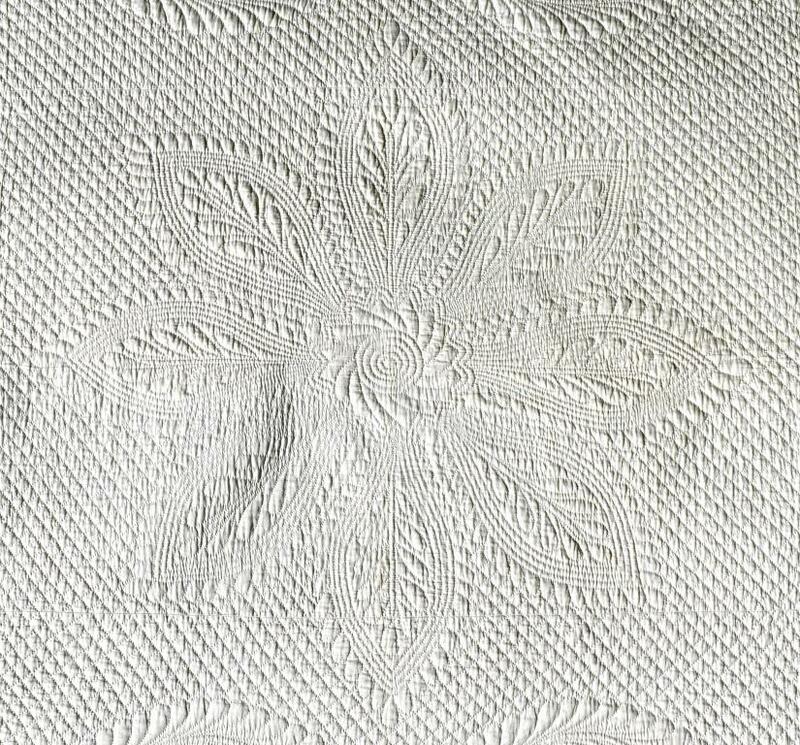 An unknown quilter made it as a gift for James & Catherine Harle on their marriage in February 1902. Catherine came from a family of farm labourers in Stamfordham (a village to the west of Newcastle, which is in the North East of England), and James was a general carter who then went on to work with pit ponies down a coal mine. 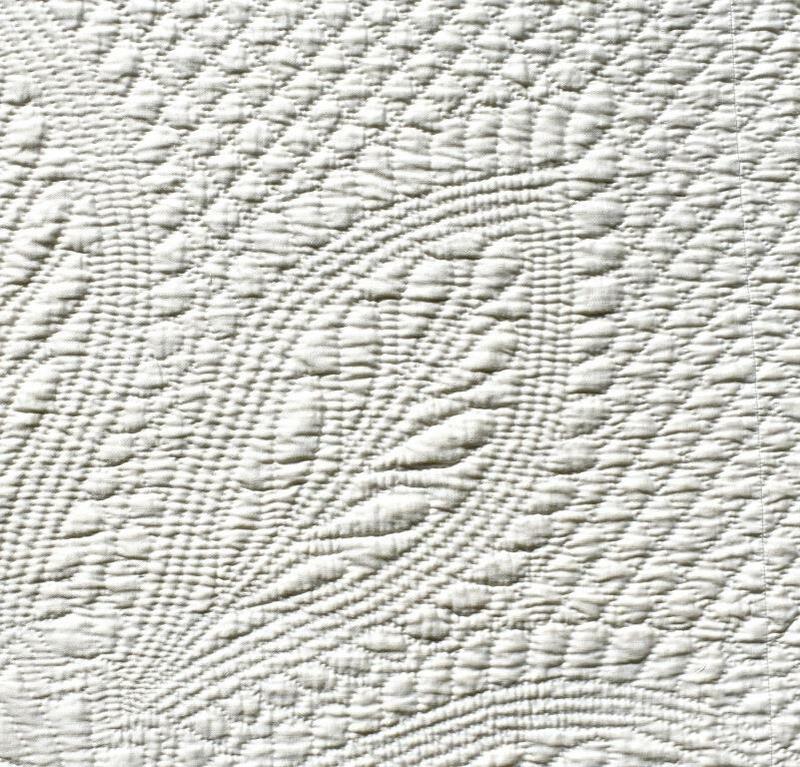 When I bought this quilt, it was an even ecru colour on one side, and cream on the other. To my surprise, on washing, the water rapidly turned a deep orange, as a lifetime of coal dust poured out to eventually reveal the original white cotton sateen. 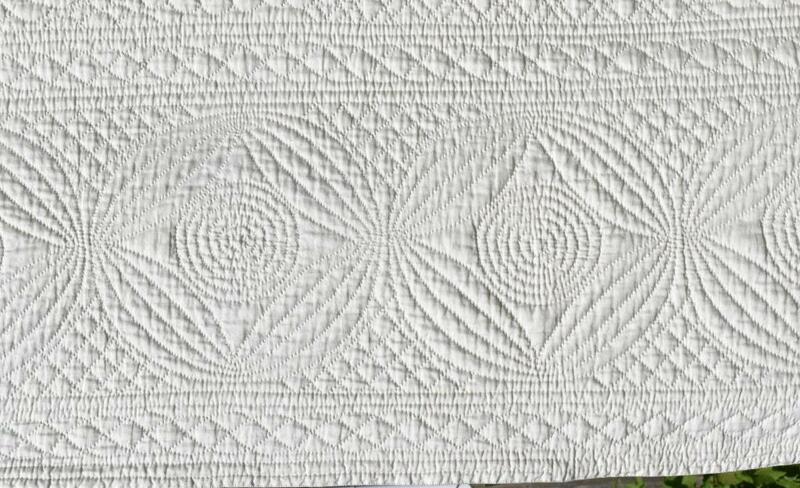 Unfortunately, it is not known who made the quilt – but given the quality of both the design and the workmanship, it is likely that the quilt was professionally made. If so, it would have been an expensive gift. The family story is that the design copied that of a quilt given to Queen Mary by the W.I. in Weardale, Co. Durham, but no trace of a wholecloth quilt can be found in the inventory of current Royal textiles, and as the first WI in the UK was not founded until 1915, this has to be (as suspected by the vendor) mistaken, or muddled. 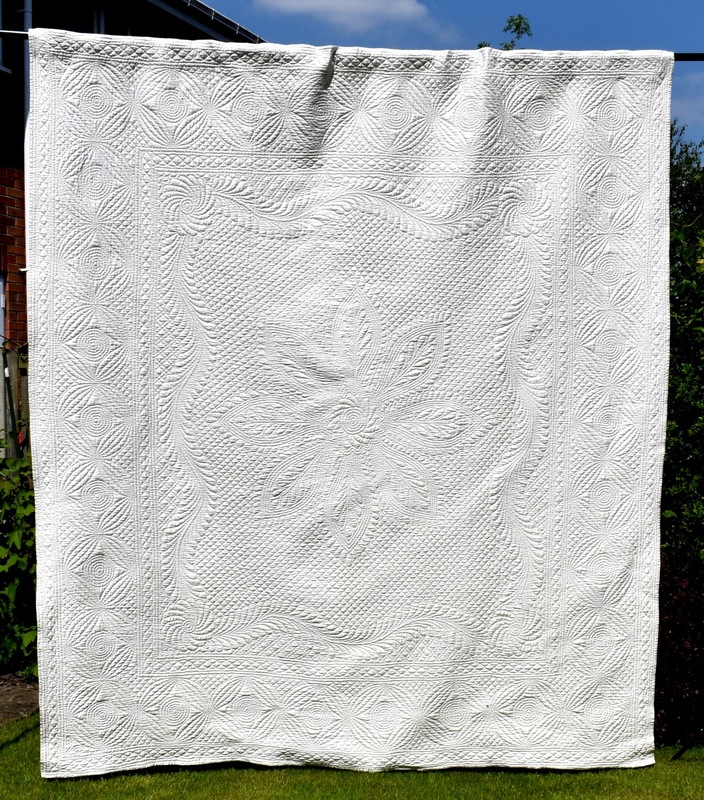 If you would like to discover more about the heritage of these hand-stitched treasures, look at the Wholecloth quilts page, where this antique quilt features with two others in a video showing the style differences found in different areas of the UK. The Yellow Lover’s Knot wholecloth quilt also shows the North Country style. 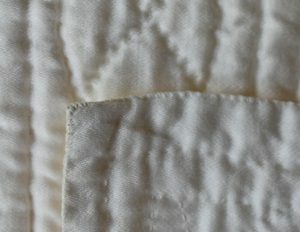 More about my research on the ways in which quilted borders tackle the corners can be found on the Border Corners page.